We have had no shortage of student achievement this year at BASIS Independent Silicon Valley. We beam with Bobcat pride each time we learn about the wide variety of our students' accomplishments both in and out of the classroom, in academic competitions as well as in sports and dance. 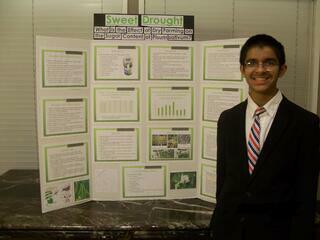 When Jaydev B. in grade 8 (Jay for short) was named as a finalist in the 2015 Broadcom MASTERS competition this fall for his project "Sweet Drought: Effects of Dry Farming on Sugar Concentrations in Pisum sativum," we realized that this is not only an incredible recognition of Jay as a student, but a wonderful illustration of some of our most fundamental goals as a school: student and teacher collaboration and the pursuit of excellence. In their own words, "the Broadcom MASTERS (Math, Applied Science, Technology and Engineering Rising Stars), is the premier science and engineering competition for middle school students. Affiliated science fairs around the country nominate the top 10% of 6th, 7th and 8th grade participants to enter this prestigious competition. After submitting the online application, 300 semifinalists are selected and 30 finalists present their research projects and compete in team hands-on STEM challenges to demonstrate their skills in critical thinking, collaboration, communication and creativity." Jay's faculty mentor, biology teacher Dr. Anuradha Murthy, shares, "there are many different levels of science competition available to students. Synopsys, the competition in which Jay won 1st award in the ecology category is a regional competition. It was at Synopsys that Jay and other students were nominated to enter Broadcom. In the middle school years, science competitions end with the Broadcom MASTERS; it is essentially the middle school version of the Intel Science Talent Search. Thousands of applications come in each year from all over the country." To bring to life the evolution of Jay being named as a semifinalist in the competition, Dr. Murthy took a step back to share some insights about our school culture. "When school started last year," she shared, "there was a lot of interest from students to conduct independent science fair investigations and enter competitions. We had many students coming to us from different public schools who had really never entered competitions before so it was an opportunity for them to experience these competitions for the first time." "After a few weeks in Science Fair Club, Jay approached me with the idea for a biology project. We developed the project together, he was very motivated. When I see students who are really motivated and willing to put in the effort, I love challenging them." Jay's motivation and determination was a distinguishing factor in his success in the competition, and also something Dr. Murthy continues to be blown away by, even months after the competition. Dr. Murthy shares, "he used to come in after school and work with me. We would work for hours, meeting briefly up to 2-3 times a day and in the evening." Jay chose a highly relevant topic to tackle for his project. Dr. Murthy shares, " His project of observing pea plants' response to a lack of water is really relevant given the drought in California. He was looking at how they can grow with little water and what regiment is optimal for plants. He grew over a hundred plants, growing them until they bore fruit (peas) then analyzed their glucose levels, among other measures. Most students do something that lasts a few weeks, but he took months to come to a valid conclusion. For a middle school student, given his other studies, to do this level of work and be dedicated, was just awesome. He didn’t make it to the finals, but for a first year student, this is remarkable." We sat down to ask Jay some questions about his project and the process that led him to this achievement. What motivated you to participate in this competition? Jay: I participated in 7th grade and it was a good experience. I wanted to do something with science again and, since we’re in a drought, I wanted to do a project related to that. I wanted to participate again and win this time. A lot of friends advanced to [the state finals] the year I did it the first time and it seemed like they had fun. J: The question was: “What is the effect of dry farming on the sugar content of the sugar snap pea?” I bought 128 plant seeds and started them from seeds, then germinated them, and then transferred them to pots. Usually you start with 2 in a pot and after a few weeks separate them into their own pots. I gave different amounts of water at different intervals to see which amount of water at which interval created optimum sugar concentration. A previous study found that 50 ML every 3 days was the best, but I found that 75 ML every 6 days produced better results even though it was less water, 25% less water. To analyze sugar concentration, we mashed the plants into an extract and added an amount of water proportional to the plant’s mass, then used a glucometer to analyze the sugar concentration. This took 9 weeks all together. All of the plants were at my home. In the middle of all of this, there was a frost night so we had to bring them in so they wouldn’t freeze. We tried to do some analysis with a spectrophotometer by creating an extract but it didn’t work. It actually became an experiment within the experiment just trying to figure out why it wouldn’t work! Eventually we just decided someone dropped it. We tried using half of the plants with the spectrophotometer, so we were left with 64 left to use the other method. Of the 64, half were grown inside and half outside. The glucometer could not detect concentration on plants inside, so we ended up with 32 total. We ended up with a few pods but didn’t use them. We found that the plants outside were really dry, but pods were bright green so all their water was going to the pea pods. Tell us a little about Dr. Murthy and her support in this project. J: She was excellent! She definitely helped me formulate my questions really well. Once we got our data I knew what to do, but I didn’t know what to do about the spectrophotometer not working, so she helped with that. In general, she is incredibly helpful and I can’t thank her enough for this. She stayed after school with me for hours to help me. She also helped me with my literature search. At the beginning, you have to see what findings have already been made in your field of interest; she helped me learn how to read research. Overall, I really enjoyed the process. Can you give us a hint on what you'll be working on for your next competition? J: I’m doing a neuroscience project. I don’t want to give away too many details! Reflecting on her experience, Dr. Murthy shared, "I would like to add that his dedication was amazing. He would come in to take a spectrophotometer, and sometimes the machine wouldn’t work or it would need to be calibrated/tweaked. This is all new science; it is not something we knew how to do or had a quick solution for. His protocol needed to be changed repeatedly. What I really admire about him is that he wouldn’t give up. There were points where I would say, 'It is not working, let's stop.' But he would say 'No, let’s try it this way.' He really ended up inspiring me. It was so neat seeing his enthusiasm even though it was 6 PM and dinner was waiting. He truly pushed himself...and me...to do the best job possible in his research. I admire his dedication, and in such a young person, it is a rare thing. I will be mentoring and coaching him again and I truly look forward to it." We're proud of Jay and of the persistent spirit that is a clearly defining element of a BASIS Independent Silicon Valley student. Our students like to step further than classroom theory into uncharted territory, pushing the boundaries of what is possible in a college-prep environment. Given his head-start in ecology, you'd think Jay would have his sights set on entering the field. However, he is, like a true BASIS Independent student, passionate and curious about many different topics. When we asked what we might want to be when he grows up, he said, "A neurosurgeon or a researcher. Definitely something with the brain. The brain is the major thing in biology, just like dark matter is in physics. We have so much left to discover on how the brain works. I think this century we will make a lot of progress. I firmly believe there is a cure to every disease, we just haven’t discovered it. I think we’ll develop technologies to track the location of electric signals in the brain, and track blood flow. It’s a field waiting to be explored and it carries a lot of potential and interest." Jay has an important final message to share: He says, "If you are reading this, I highly recommend you participate in one of these events." Jay, we couldn't agree more! Student achievement, especially when sprung from strong collaboration between our teachers and students, is the heartbeat of our school community. Read more about the Broadcom MASTERS here and join us in congratulating Jay and Dr. Murthy on a wonderful collaboration. In Head of School Mr. Toby Walker's words, "This collaboration between students and faculty is exactly the type of activity we want to promote here at BASIS Independent Silicon Valley." We can't wait to see what next year's competition brings and look forward to sharing more exciting student achievements with you.